Guilt Written All Over His Face | 2P START! My hat is off to Ray for giving this comic such a nice ‘gritty’ look. I think the style works very well with the simple, text-less comic. I’ll be the first to request this as a wallpaper! I honestly don’t know what kind of reception this comic will get, and while I hope people like it, I’m really so happy with it personally that it doesn’t matter as much to me how people take it. Plus, Ray managed to slip in a little hidden joke that even I didn’t notice! Also, some trivia for you: that’s Jr. Pac-Man in the foreground identifying the criminal. In Jr. Pac-Man (a Bally Midway game made without Namco’s permission), the Orange ghost is named Tim instead of Clyde, and the Pink ghost Yum-Yum, daughter of Blinky, is actually in a relationship with Jr. Pac-Man (not sure how that works!). I second your request Tim. And I’m afraid I’m missing the joke as well. Either way NCG. First post ever, although I’ve listened to the podcast for ages now. However, shouldn’t the title have been ‘Guilt written ALL OVER his face’? Anywho, keep up the good work (loved the election ads). Funny comic! I also like your logo today. I would also enjoy a wallpaper of this. Only 8 more! Not sure I see the hidden joke either, but are the ghosts really 15 feet tall? What is the secret joke? Tell me if I am wrong, but I think they are being measured in pixels. I know the ghosts are either 14 or 15 pixels tall. Edit: yep they are 15 pixels tall. just checked. double edit: most of the time. when they are looking up they are only 14 tall. Love it! Nice and simple. But if Jr.’s the one doing the identifying, what does that mean about Mr. Pac Man? Just when they were recovering from that accident at the runway with Mrs. Pac-Man, Mr. Pac-Man had to be murdered by ghosts. Now Jr. is left alone to fend for himself. Let us have a moment of silence for his loss. My guess for the secret joke is [spoiler]that the ghosts are 14 pixels tall (at least from Wikipedia’s screenshots), although I would debate the height in the picture is 14. Many there’s one of the bajillion versions of Pac-Man out there with 15-pixel ghosts, though. Either way, it’s really nitpicky/nerdy to debate one pixel. EDIT: darn, beaten while I was typing up my paragraphs of post. Yeah, but at least you had the brains to mark it a spoiler. I feel stupid that I didn’t think to do that. I gotta say, I really liked this comic. I fourth the call for wallpaper. NCG. Yeah, okay. I hate doing this, but I really do not get the joke at all. I’ve come to realize that I’m not exactly the brightest person here, but…yeah. Is it that the ghosts are all in a box like in the beginning of a game? Have you guys never seen a police lineup? Haha! Nice comic guys! Definitely one of your more clever comics. Yeah, so what’s the extra joke? Yes, I was fully aware that it was a police line-up. Then in an attempt to get the joke I went through pacman in my head. “Okay, so the ghosts turn blue when you’re about to eat them, when you’ve eaten one of those things…” But with that I could not make the connection to what I was seeing. I thought maybe because he was being pointed out by Jr. that he was going to metaphorically “be eaten” but I dunno…sorry. i think its just supposed to be the expression thats funny. Yeah, I always interpreted the ghosts expression as that of ‘fear’ when Pac-Man was powered up. I don’t think the ghosts are weakened by the power pellet, it’s just that Pac-Man is strengthened, so the ghosts are afraid and run away from Pac-Man. That being said, our ghost in the middle is scared because he knows he’s guilty. Wait, If Tim is the orange Ghost, What color is Ray? Dang, First his dad gets Roadkilled and His mom dies at the Fashion show… What’s an orphan to do? good comic, I like the classics more than some of the newer games so that gets more from me. …By the way, Yum-Yum is Red, she is just smaller and has a bow on her head. In a way it could be an arcade version of ‘Romeo and Juliet’, Two lovers from warring families run off and then they Fall into love that nothing can stop… Exept they don’t kill themselves at the end. INCREDIBLY OBVIOUS THINGS THAT I MISS!!! Yeah, so that had never occurred to me that Pacman was being strengthened, I just assumed it weakened the ghosts. I belive that Tim is usually represented with blue, while Ray is orange. Now, since Tim already claimed orange, Ray must take the remaining color, which is blue. EDIT: I fail. Ray is RED. Darnit, Ray, change your color! 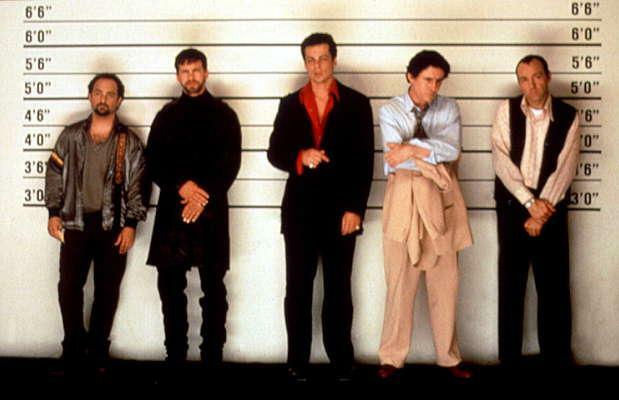 Am I the only one who immediately thought of The Usual Suspects when I saw the lineup? So I was reading through the comments, and there are an awful lot of them that say they don’t see the joke. It’s so OBVIOUS! I absolutely loved this comic. And yes, Tim, you make a great request. My favorite part about this one-paneled strip are the eyes from Yum-yum, Tim and the red ghost are all like, “umm….duuudddeeeee….” or at least that’s what I’m seeing in their eyes. Hello everyone, I’m quite a new reader I just thought I would step out of the dark, I really like all your comics. I really mean it! They’re fantastic! I haven’t listened to podcasts yet because of my previous experiences with them but maybe I’ll give it a try. Let the obsessive compulsive fans unite! You are not. I love that movie. Well, through the transitive property, you’re right since that shirt is based off the title of the movie. And he might have been referring to the shirt as well. That would make more sense actually. …don’t we ALREADY have a commenter named Rokai? They might have just deleted their avatar and be trying to get comment of the week. But I’m just not trusting of people i guess. It just seems like a bit too much of a coincidence to me. Where is the hidden joke?! Hello everyone, I’m quite a new reader I just thought I would step out of the dark, I really like all your comics. I really mean it! They’re fantastic! I haven’t listened to podcasts yet because of my previous experiences with them but maybe I’ll give it a try.P.S. :What does NCG mean? Wait a minute…. my spidey senses are tingling……don’t we ALREADY have a commenter named Rokai?They might have just deleted their avatar and be trying to get comment of the week.But I’m just not trusting of people i guess.It just seems like a bit too much of a coincidence to me. When I first saw it, I thought that perhaps Pac-Man Jr. was looking at the suspects, and trying to identify the ghost that killed his father, which was obviously the “nervous” one, but maybe that’s not what Tim and Ray had in mind with this one. Nope. I was talking the movie. *gasp gasp* i just read through all 92 comics in 4 hours. It was definately worth it but GAH!! Keep up the good work guys! I never really payed that much attention to Pac-Man. Of course, I’ve never played the original. I only played Ms. Pac-Man, which didn’t really appeal to me. I started playing video games when I was eight, and my first was Unreal Tournament; maybe I’m just conditioned to enjoy more action-oriented games. good god man, take a freaking break! Also, while listening back to some of your older podcasts, you were talking about having a shirt with nubby elbows on it and some phrase. Well I instantly had one come to mind. Just thought I’d throw in my mangled two cents. My hat is off to Ray..
No it’s not. It never is. Don’t lie to us, Tim. @Gadoink: So you’re suggesting that they should draw each ghost separately?